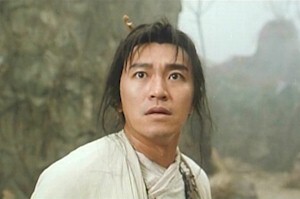 The Skinny: Stephen Chow is excellent in this hilarious take on the Monkey King legend. The film occasionally sags, becoming messy and repetitive, but it rights itself near the end in preparation for Part 2. The first part of Jeff Lau’s Monkey King epic is funny in places, touching in others, but overall somewhat messy and repetitive. Based on the classic Chinese tale "A Journey to the West,'' this movie has the Monkey King (Stephen Chow) banished to human form awaiting his master, the Longevity Monk (Law Kar-Ying), to return him to his god-like form. Five hundred years later, the Monkey King is reincarnated as a loser named Joker (also Stephen Chow) who’s is plagued by two evil sisters (Yammie Nam and Karen Mok) who’ve shown up at Joker’s desert outpost because they have this hunch that the Monkey King will show up there after disappearing five hundred years ago (got all that?). Of course he shown up again, but the two sisters wouldn't know because they only see Joker and not the Monkey King. Not yet, anyway. Here’s the deal: the Monkey King stays a human until he completes the “Journey to the West.” But, the Longevity Monk is dead, so how can Joker find him? Simple: there’s this thing called “Pandora's Box” which can send Joker back in time where he can find the Longevity Monk who’ll make him a monkey again and then together they can complete the quest. Whew.